Dentures are designed to replace missing teeth, and are worn by millions of Americans. Technological advancements have resulted in dentures that are lightweight and mimic the look and feel of natural teeth. Most dentures are made from a combination of metals and synthetic material such as acrylic resin. Dentures are generally classified as partial or full. Partial dentures are designed to replace a small section of teeth, and help prevent existing healthy natural teeth from shifting position; full dentures generally replace an entire set of teeth such as upper and lower dentures. Many candidates for conventional dentures (also called “immediate” dentures) are able to wear the appliances immediately following removal of affected natural teeth. Before immediate dentures are worn, a mold of the patient’s mouth – specifically the jaws – must be made in order for the dentures to be customized for the individual. Partial dentures, also sometimes called “overdentures,” are designed to fit over a small section of implants or natural teeth. Partial dentures are characteristic by their pinkish gum-like plastic bases, on to which replacement teeth are attached. Small clasps are used to attach the denture to existing teeth. Some clasps, which can be more expensive, are made of natural-looking material that is hard-to-detect. In some cases, a crown will be installed on an existing healthy tooth to facilitate a better hold for the clasp. Denture candidates can expect to have their appliances fitted after about five visits. The process takes about a month. During the first visit after diagnosis, your mouth and jaw are measured and an impression is made. The impression is critical for ensuring proper bite relationship, as well as the proper relationship of the appliance to the size of your face. After the impression is made, a temporary set of dentures may be applied so the patient can ensure that the fit, color and shape are suitable. New dentures do take some time getting used to. Wearers can expect this period of adjustment to last as long as two months. Some denture wearers need to wear their dentures without removing them for a certain period of time. This allows your dentist to make the critical initial adjustments for proper fit, and to identify any pressure points that may be causing discomfort. However, keep in mind that just like your teeth, dentures should be cared for with diligence. This means daily brushing and regular visits to your dentist for minor adjustments. • People can brush their dentures in a variety of ways. Some people use soap and water or a slightly abrasive toothpaste. Popular denture pastes and creams also can be used. • Avoid using highly abrasive chemicals or pastes, or vigorously brushing with hard bristled toothbrushes. These can scratch or even crack dentures. • Hold your dentures gently to avoid loosening a tooth. 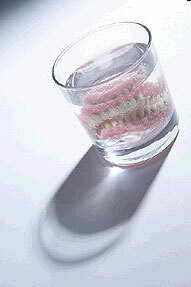 • Clean your dentures with cool or tepid water over a water-filled sink. Hot water may warp a denture. A small washcloth placed in the bottom of the bowl will ensure that your denture isn’t damaged if it falls. • Soak your dentures overnight in any commercially available product like Efferdent or Polident and remember to rinse your dentures before placing them back in your mouth. • Remember to use a separate toothbrush to clean your own natural teeth, as well as all of your gum tissues. In lieu of a toothbrush, a soft washcloth may be used to wipe your gums. People’s mouths undergo change all of the time. Gums change shape; in many cases, gums tend to shrink over time after teeth have been extracted. Most denture wearers experience a break-in period of as long as two months, during which the tissues surrounding their extracted teeth must heal. Conventional denture wearers must periodically visit their dentist to have the appliances adjusted. This is because patient’s gums sometimes change shape or shrink; moreover, daily maintenance of the appliances over time may also obviate the need for minor adjustments. Adjustments are critical because a loose-fitting appliance, or one that has not been adjusted to compensate for gum or jaw changes could cause pressure points, leading to mouth sores and possible infection. Regular dental visits also provide an opportunity to replace or repair loose teeth, or make small repairs to dentures that may have become chipped or cracked. Over the long run, the base of a denture may need to be “re-lined” because of wear and tear from constantly rubbing against your soft palate or roof of your mouth. Technology advancements have made dentures very natural looking; however, it is only natural for first-time denture wearers to be self-conscious about their appearance and speech. Over time, a denture wearer’s confidence level increases, and this usually ceases to be an issue. Like any new thing, caring for dentures takes practice. Under normal circumstances, denture wearers can eat most foods with confidence that their appliance will not shift. Caution must be taken, however, to avoid certain kinds of hot, hard, crunchy, chewy or sticky foods. During the break-in period, denture wearers are usually advised to eat on both sides of their mouth so the appliances don’t get out of balance, or tip to one side. In general, dentures that fit well may still need a small measure of help staying put. A good quality denture adhesive is acceptable. Older, poorly fitting dentures may damage the soft tissues of the mouth, and should be replaced as soon as possible.